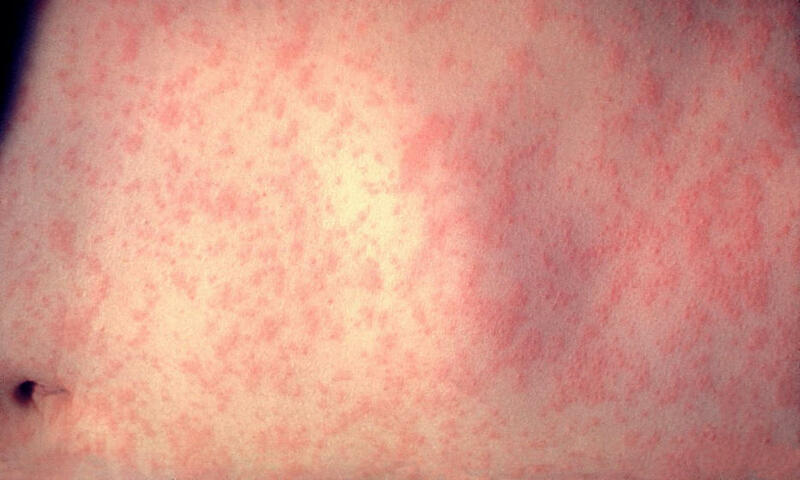 The rash caused by measles. WILLITS, 4/8/19 -- A measles outbreak in the Pacific Northwest, mostly around the Vancouver, WA and Portland, OR area, has prompted concern among health departments on the North Coast. Both Mendocino and Humboldt county health officials are now expressing concern for what a measles outbreak could mean here, especially due to the relatively low rates of vaccination in the area. The measles vaccine is safe, while the disease is quite serious, often resulting in life long complications and in some cases death. A measles outbreak has emerged near Portland, Oregon with 38 confirmed cases and 13 suspected cases since January 1 so far. Most of those infected have been children under 10 years of age, and there is a correlation with greater numbers of cases occurring in areas with lower than average vaccination rates. While this is considered a “Public Health Emergency” in the affected areas around Portland, no cases have been seen in Northern California as of this time. At the Mendocino County Public Health Department, we are invested in the health of our community, and we are determined to dispense information that may be useful in preventing measles or in identifying it soon after it appears. Measles is a highly contagious viral disease. It is widespread in many parts of the world, including Europe, Africa, and Asia. It begins with a fever (which can reach as high as 104 degrees Fahrenheit) that lasts for a couple of days, followed by a cough, runny nose, conjunctivitis (pink eye), and a rash. The rash typically appears first on the face, in the mouth, along the hairline, and behind the ears and then affects the rest of the body. Infected people are usually contagious from about 4 days before their rash starts to 4 days afterwards. The virus lives in the nose and throat mucus of an infected person. It can spread to others through coughing and sneezing. Surprisingly, the measles virus can live for up to two hours in an airspace where the infected person coughed or sneezed. If other people breathe the contaminated air or touch an infected surface, then touch their eyes, noses, or mouth, they can become infected. Measles is so contagious that if one person has it, 90% of the people close to that person who are not immune will also become infected. It can be fatal. As many as one out of every 20 children infected with measles gets pneumonia, the most common cause of death from measles in young children. One in every 1,000 children with measles develops swelling of the brain that can cause deafness or an intellectual disability. Pregnant women with measles might give birth early or have a low-weight baby. The last large outbreak of measles in California was associated with Disneyland and occurred from December 2014 through April 2015, when at least 131 California residents were infected. Immunization is thought to be 97% effective, and most children are adequately vaccinated by the time they enter Kindergarten. Child care facilities and schools with low vaccination rates are at increased risk for outbreaks of this vaccine-preventable disease. It is not too late to get vaccinated now; it may even help up to 72 hours after exposure. You can lookup vaccination rates at the schools in your area to see if your child is more likely to get the illness. There is no effective treatment. The best thing to do is to keep your child at home if they become ill with a suspicious rash. Letting them out in public makes it much more likely to spread. Getting medical help if they are getting quite ill, especially with pneumonia or severe headache is important. What about the Vaccine? There is a vaccine (that comes in a shot) that keeps people from getting measles. It is called the MMR vaccine. It protects against 3 different infections: measles, mumps, and rubella. Contact your medical provider if you or your child haven’t been vaccinated. Should I call the doctor or nurse if I think my child or I have measles? — Yes. If you or your child has a fever and rash, call the doctor or nurse. He or she can ask questions and tell you what to do next. Don't go to the doctor's office without calling first. Measles spreads easily, so you could give it to other people at the doctor's office. What if I was near someone with measles? — If you or your child has not had the MMR vaccine, call the doctor or nurse. It might still be possible to avoid getting sick. If you get it soon enough, the vaccine can stop measles or make it less serious. People who cannot get the vaccine can take a medicine that can help keep them from getting sick. Is there a test for measles? — Yes. The doctor or nurse can do blood tests to check for measles. However, these tests might not be needed. A doctor or nurse can often tell if a person has measles by doing an exam and learning about the symptoms. How is measles treated? — For most people, there is no specific treatment. If you or your child have it, you can: Rest, drink plenty of fluids, take acetaminophen (sample brand name: Tylenol) to help with fever and aches. *Do not give aspirin or medicines that contain aspirin to children younger than 18. In children, aspirin can cause a serious problem called Reye syndrome. Doctors give vitamin A to some children with measles. If your child needs treatment in the hospital, or has another health condition besides measles, the doctor might give vitamin A. You may contact the Mendocino County Health Department with questions at (707) 472-2600. Press release from the Mendocino County Public Health Officer.